Bruce Goodison’s feature debut, the good-natured Leave to Remain (2013), imbues the meticulous rigour of a documentary with the conventional methodology of a narrative drama to create an unusual deviation on the coming-of-age tale. A film about children thrust into adulthood thanks to their status as asylum seekers, Goodison looks to give a voice to the thousands of young refugees currently fighting their case in the courtrooms of the United Kingdom. 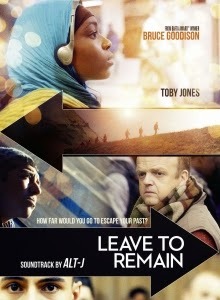 Leave to Remain takes the perspective of a young Afghan boy whose arrival at a local refuge home (run by Toby Jones’ English teacher) sets off a fateful chain of events in the local community. This tale of hope, desperation and deplorable discrimination allows us to reinterpret the familiar through unacquainted eyes. Starring recognisable British actors like Jones alongside bona fide refugees, Goodison allows the pupils of his film academy to articulate themselves through their performances, giving these young teens a chance to regale their own stories whilst simultaneously raising awareness about the staggering number of children who come to our country each year seeking asylum. ‘Leave to remain’ is an immigration status granted to a person who doesn’t hold the right of abode in the UK, but who – more often than not for humanitarian reasons – has been admitted without any time limit on their stay. From armed raids, security checkpoints and belligerently xenophobic advertising, this deplorable disregard for humanitarian rights makes the message contained within Goodison’s semi-documentary a pertinent and important one. Boasting an original soundtrack from Mercury Prize winner Alt-J and the mercurial presence of Toby Jones, Goodison has certainly pulled out all the stops to make Leave to Remain an audible soapbox for his enthusiastic amateur actors, whilst never relying on sensationalism to get his message across. It’s undoubtedly at its best when the young cast are let loose, clearly enjoying the experience bequeathed to them and seizing it with both hands. This candid and incredibly good-natured approach works well, yet there’s a sense that a hard hitting documentary or entirely dramatised tale might have been more effective in conveying this earnest plea. Emotive music and gritty realism never quite coalesce into a digestible form of cinema and whilst we remain rooted to each character’s tale, we’re very much aware that they’re just that, characters reciting clearly reimagined versions of the truth. Commendable for giving children a voice and approaching a serious issue in a unique and intriguing fashion, Leave to Remain is a film that demands to be seen – if only to help teach us the true importance of humanity.